My parents live in upstate NY where Wegmans is a convenient treat. Wegmans is a supermarket that strives to make your grocery getting a real luxury experience. The other day I saw a picture of pasta in the window on the way out. You know how some women have cravings when pregnant- I did not, because that is how I view food at all times! So of course my mom and I were back yesterday and sure enough after a few minutes a young employee in the produce department delivered us the printed recipe. Well… this in of itself is awesome. To just walk into the store and be handed a recipe (with the locations of all the foods) is probably enough to keep me from ordering take-out. I would say I almost got these ingredients and cooked them faster than ordering out, with almost as much ease. Turns out my local supermarket has a similar concept, Publix Apron’s Simple Meals. I have to assume all grocers are doing this just out of the sheer brilliance. (The recipes tend to be all store brand products). So here is what we had. 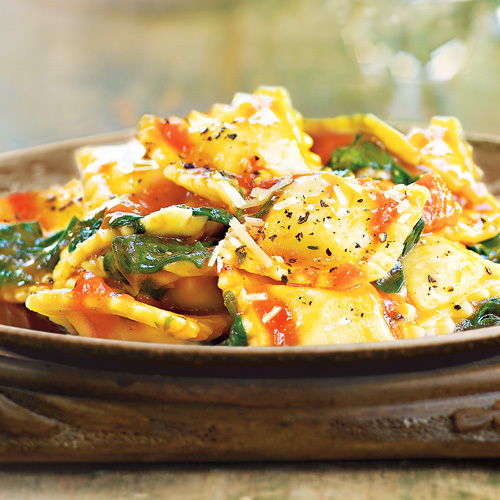 Three Cheese Ravioli with Baby Spinach and Spicy Arrabbiata Sauce. Next time I would double it. We had enough for 3 adults and two kids (who licked their plates clean and asked for seconds-huge added bonus). When I food shop and cook I like to get more bang for my time and have leftovers. Also, I would add pine nuts to get a little MUFA action going on.